Fangirl Review: Attention Fans: Reserve the X-O MANOWAR #1-3 PRE-ORDER BUNDLE by January 26th and Get Exclusive Content for Valiant’s Biggest Release of 2017! Attention Fans: Reserve the X-O MANOWAR #1-3 PRE-ORDER BUNDLE by January 26th and Get Exclusive Content for Valiant’s Biggest Release of 2017! 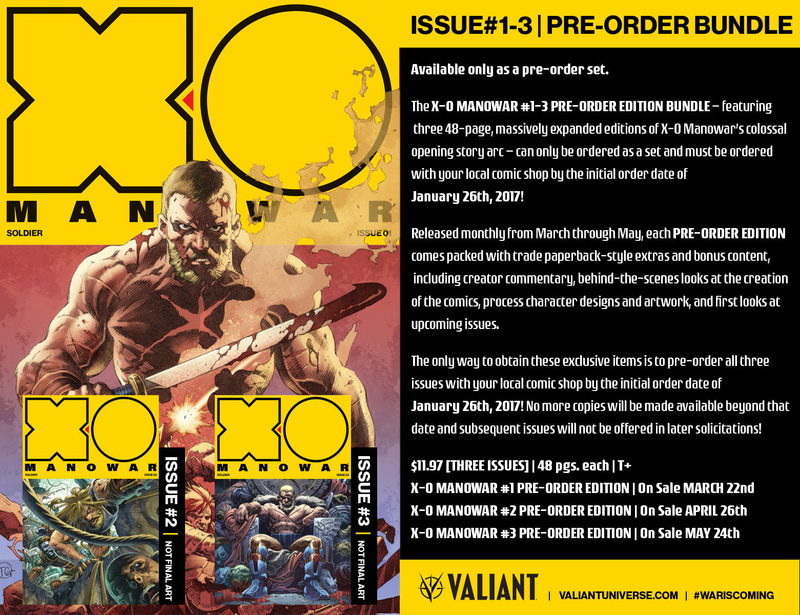 War is coming…and, now, Valiant is rewarding fans who pre-order early with specially expanded, exclusive editions of X-O MANOWAR’s introductory story arc by visionary creators Matt Kindt and Tomas Giorello! 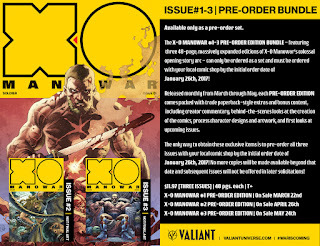 Valiant is proud to announce a first-of-its-kind offering with the X-O MANOWAR #1-3 PRE-ORDER EDITION BUNDLE – available only as a pre-order set to fans who reserve copies for the first three issues of X-O MANOWAR, encompassing the complete “SOLDIER” story arc, by the initial order date of January 26th, 2017! Available only as a pre-order set, the X-O MANOWAR #1-3 PRE-ORDER EDITIONS must be ordered as a complete bundle at your local comic shop by the initial order date of January 26th, 2017! Released monthly from March through May, featuring exclusive covers by series interior artist Tomas Giorello and clocking in a colossal 48 pages each, every PRE-ORDER EDITION comes packed with trade paperback-style extras and bonus content, including creator commentary, behind-the-scenes looks at the creation of the comics, process character designs and artwork, and first looks at upcoming issues. The first PRE-ORDER EDITION will arrive in stores on March 22nd, 2017alongside the standard, 40-page X-O MANOWAR #1. As unveiled last week at Entertainment Weekly, Valiant recently announced its first series of the New Year with the all-new X-O MANOWAR #1 – the FIRST ISSUE of AN EPIC NEW ONGOING SERIESfrom New York Times best-selling writer Matt Kindt (Divinity, Ninjak, Mind MGMT) and an all-star arsenal of the most formidable visual storytellers in comics today – including Tomas Giorello (4001 A.D.: War Mother, Bloodshot Reborn), Doug Braithwaite (Armor Hunters, Bloodshot U.S.A.), Clayton Crain (Rai, Carnage), Ryan Bodenheim (The Dying & The Dead), and Mico Suayan (Bloodshot Reborn) – that together will span the series’ first year in 2017 and beyond!